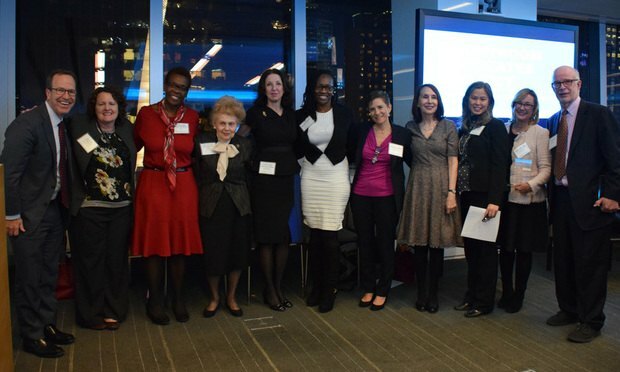 The Courtroom Advocates Project, which helps domestic violence victims in New York City seek orders of protection in Family Court, marked its 20th anniversary on Nov. 16 at a celebration hosted by Proskauer Rose. The Courtroom Advocates Project helps domestic violence victims in New York City seek orders of protection in Family Court. Law students and law firm associates work under the direction of attorneys from Sanctuary for Families’ Legal Center and the New York Legal Assistance Group. The project marked its 20th anniversary on Nov. 16 at a celebration hosted by Proskauer Rose at the firm’s Times Square office. Former FBI Director Louis J. Freeh and Anne Vladeck, a partner at Vladeck, Raskin & Clark, received The Robert Morgenthau Award during the 21st annual Police Athletic League Legal Professional Luncheon. Legal Services NYC honored Peter Beshar, executive vice president and general counsel of Marsh & McLennan, and Sheila Boston, partner at Arnold & Porter, at its annual Jazz for Justice Benefit. The Committee on the Supreme Court of the New York County Lawyers Association hosted their annual reception on April 4 to honor newly elected, appointed, re-elected and re-appointed judges.